Former Mozambique President Joaquim Chissano has won the first Mo Ibrahim prize rewarding a retired African head of state for excellence in leadership. 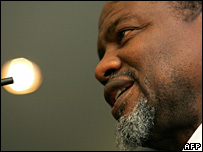 Mr Chissano, who is credited with bringing peace to Mozambique, had been seen as a frontrunner for the prize. The prize, announced by former UN head Kofi Annan, is worth $5m (£2.5m) over 10 years, and then $200,000 a year. Mobile phone millionaire Mo Ibrahim is funding the project in the hope it will help improve governments' performance. The Sudanese businessman also hopes it will increase Africa's self-sufficiency and bring a day when the continent's people no longer need to live on aid. Mr Annan chaired the panel that awarded the prize, billed as the largest of its kind. Mr Annan praised Mr Chissano for "his most outstanding contribution" to peace and democracy. "This remarkable reconciliation between opponents provides a shining example to the rest of the world and is testament to both his strength of character and his leadership," Mr Annan said. After winning independence from Portugal in 1975 Mozambique suffered a civil war that lasted until 1992. Mr Chissano was president from 1986 to 2005. He also served as chairman of the African Union in 2003 and 2004, and has worked as a UN envoy. Mr Annan praised Mr Chissano's role at home and more widely in Africa. "His decision not to seek a third presidential term reinforced Mozambique's democratic maturity and demonstrated that institutions and the democratic process were more important than personalities," he said. "He was a powerful voice for Africa on the international stage and played an important role in pushing debt relief up the agenda." Mr Chissano is something as a rarity in Africa as a leader who has left office with his reputation intact, says BBC southern Africa correspondent Peter Biles. His son, however, faced allegations - strongly denied by him - that he was linked to the murder of a Mozambican journalist, Carlos Cardoso. The BBC's Martin Plaut asked Mr Annan if this had given the judges pause for thought. "We discussed all that. There was a judicial process and Chissano said himself that justice must be done. 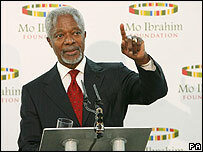 And there was no evidence that he had tried to block it," Mr Annan said. "You cannot blame him for something his son is alleged to have done - his mature son." The panel of judges also included former Irish President, Mary Robinson, former Finnish President Martti Ahtisaari and the head of the Organisation of African Unity, Salim Ahmed Sali. They assessed the relative merits of 13 African former heads of state, all of whom left power in the past three years. Among these at least six took power by staging coups.